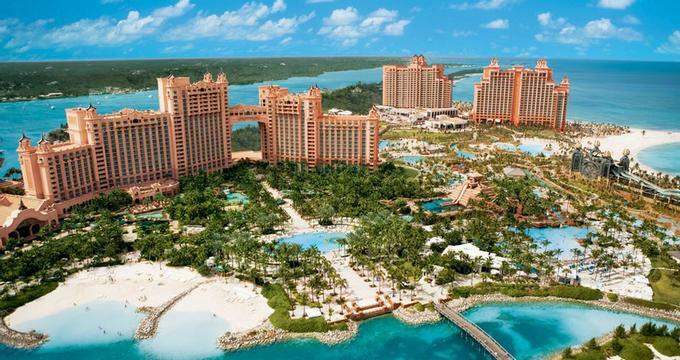 Atlantis Paradise Island Resort in the Bahamas is a destination that offers something for everyone and gets our vote as one of the best family vacation spots. Relax at one of the 10+ pool areas or on sandy beaches after enjoying one of the spa treatments at Mandara Spa. There is a choice of accommodation options, including several resort towers (Beach, Coral and Royal), condos at the Harborside Resort, The Reef and the exclusive Cove, favored by couples. There are many great activities to choose from on vacation. Take a complimentary scuba diving lesson or enjoy snorkeling at the seven-acre Paradise Lagoon which features schools of tropical fish on your family vacation. You can also play golf at The Ocean Club Golf Course which has spectacular ocean views. The property houses the largest man-made marine habitat in the world comprising of more than 50,000 marine animals and over 200 species. This Bahamas resort offers vacationers great beaches, pools, water slides and rides, spa services, golf, adventure excursions, shopping and a casino. The Entertainment Complex provides gaming, honeymoon, romantic, adventure, dining, dancing and exclusive shopping. Surrounding the casino in the Entertainment Complex are outstanding dining and entertainment options. Atlantis features a wide selection of rooms, from world-class luxury suites to moderately-priced rooms. The Current: Sit in your own tube and get propelled down a mile-long river via water escalators, waves and rapids. You will be propelled both up and down on this unique ride. LEGO Construction area: Kids who love to build with Legos, duplos and other kinds of building blocks can have a lot of fun in the Atlantis Lego Construction area. They can build their own creation of join other kids and complete a team project. The Surge: The Surge at Atlantis is meant for teens and grownups, offering spectacular views of the island and a thrilling ride. Water Playground for Toddlers: This is a slide and playground surrounded by water, in water, perfect for toddlers who like to get wet. Gaming Tree with Customized Pod Chairs Featuring Surround Sound: The Teen Club has a gaming tree and private gaming cabanas, perfect for a solo game or one with friends. Aqua Tots: Aqua Tots is a program that lets children learn about marine life hands-on. Mayan Temple: The Mayan Temple waterslide is tall and exciting for teens and grown-ups. Culinary Kitchen: The Culinary Kitchen lets children learn how to prepare a meal and have fun in a colorful environment. The Predator Tunnel: The Predator Tunnel lets you see sharks from up close. You can walk through the tunnel and observe the amazing creatures from below. The resort offers a diverse choice of venues, catering services and event planning options. Couples can choose from small and intimate to larger deluxe gatherings. The property offers venues that range from private celebrations on the sand to larger ceremonies overlooking one of the lagoons or next to a waterfall. If you want to hold your reception near the ocean, Cave Bar and Grill overlooks the ocean and can accommodate up to 125 guests. The resort has 21 restaurants and 19 bars and lounges. Chef Bobby Flay's award-winning Mesa Grill serves Southwestern cuisine with a Bahamian twist. Nobu serves Japanese cuisine by celebrated Japanese Chef Nobu Matsuhisa. Sample gourmet French food on vacation at Cafe Martinique, French-Asian cuisine at Dune, Mediterranean cuisine at Courtyard Terrace, and many other delicious options. If you are looking for a Caribbean honeymoon with many activities, attractions and a choice of accommodations for different budgets, this famous resort offers a range of unique activities, including Dolphin Cay where you can swim with dolphins and sea lions. You can even sign up for the "Trainer for a Day" program and get up close and personal with these incredible marine animals, feeding, training, caring and playing with dolphins and sea lions. There are many fine dining options, whether you are looking to sample Asian, French, Italian or Mediterranean cuisine. Be sure to allow some time for a relaxing couples' massage at the beautiful Mandara Spa. Nassau International airport is approximately 13 miles from Atlantis and costs approximately $25 each way by taxi. If you are looking for luxury island getaways in the Bahamas, take a look at the stylish suites at The Cove Atlantis. The 600-suite hotel is a part of the extensive Atlantis resort complex. Suites measure at least 650 square feet in size, featuring two plasma-screen TVs, a BOSE 3-2-1 entertainment system and a custom in-room bar. Enjoy luxury amenities at this unique resort, such as open ocean views and beautiful marble bathrooms. The adults-only pool has an outdoor gaming pavilion and 20 private cabanas. The pool is open exclusively to guests staying on the property. The ultra-luxurious Penthouse Suite (from $15,000 per night) measures 4,070 square feet in size and occupies two floors with scenic ocean views. The suite is great for entertaining, featuring a beautiful dining area, a full chef's kitchen and butler's office. For those who had a hard time convincing their teen sons and daughters to go to Atlantis, the resort just opened a new teen hotspot "Crush" which cost $11 million to build. The 14,000 square-foot club has a dance club, gaming stadium and an internet lounge for publishing to social media sites. The Gaming Stadium has a custom-built 22-foot floor-to-ceiling Gaming Tree where kids can test their gaming skills. The tree is equipped with 32 flat screen televisions, 24 controller-based gaming consoles and 24 customized pod chairs with built-in surround sound. Individual play and gaming competitions are offered. The unique private cabanas at the Gaming Stadium are feature state-of-the-art technology including the newly launched Microsoft flagship motion sensor product Kinect for Xbox 360. The complimentary cabanas can be reserved in advance and accommodate up to 8 people. The dedicated cabana Gaming Concierge will pre-load requested games and personalize settings for each individual. Harborside offers villas with fully equipped kitchens, sofa beds in the living room and a dining area. Each one-bedroom villa can accommodate up to 4 guests. In addition to the kitchen where you can prepare your own meals, the villa has a jetted tub in the bathroom, washer and drier, and designer furnishings. Harborside is available on a timeshare basis, or you can rent a villa through services like vrbo.com or homeaway.com. Combine a trip to a Caribbean beach with gourmet dining at Atlantis which features 21 restaurants and 19 bars and lounges. Chef Bobby Flay's award-winning Mesa Grill serves Southwestern cuisine with a Bahamian twist. Nobu serves Japanese cuisine by celebrated Japanese Chef Nobu Matsuhisa. Sample gourmet French food on vacation at Cafe Martinique, French-Asian cuisine at Dune, Mediterranean cuisine at Courtyard Terrace, and many other delicious options. The resort is a popular family destination with a choice of activities for guests of all ages. The resort offers programs for kids in three age groups. Morning Escape for ages 3 to 5 has activities that range from face painting to creating aquariums. Rates from $40 per child for a 9am-to-noon session. Evening Escape is a program that lets kids participate in activities while parents get some time off for a romantic dinner. Children ages 6 to 12 can participate in different adventures, such as pool games, Beach Olympics, kayaking in Paradise Lagoon and others. Five children are selected daily to participate in fish feeding at the resort. To register a child, visit the Atlantis Kids Club. Atlantis Paradise Island Resort has two dedicated pools for kids with mini water slides and fountains in the shape of animals kids can climb on. Does the Resort Offer Deals and Packages? The resort offers many attractive specials for families and couples. Offers are usually seasonal because rates change depending on your time of travel. Prices range from $185 to over $2,000 per day depending on season and room choice. Packages are often available for families and couples.